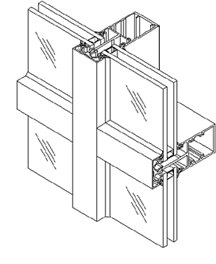 Flushlok II® is a custom manufactured front-set, thermally broken, single-span slim line storefront system, and is specifically designed for installation with insulated glass, but may be adapted for installation with other infills. It’s efficient thermal qualities are achieved through the use of a Celcon clip that separates the face cap from the back member. Flushlok II® is available in two standard face cap depths and three back member depths for structural integrity (dependent upon wind load condition) to result in overall system depths from 4-1/2" to 6-1/2" increments. All framing members are square cut, which, when combined with screw spline construction, allows for ease of fabrication and installation in either unitized of modular mode. Also, shear block construction can be specified in order to obtain greater flexibility. Flushlok II® is a custom manufactured 1-3/4" wide profile thermally broken system and is primarily designed for horizontal strip windows and storefront. Door framing components are available for stock and custom doors. Celcon clips thermal separation between the face and back members, thus adding to the versatility of this economical, thermal system. Available in both anodized and painted finishes with a variety of standard and custom color choices. Meets all AMMA air, water, and structural requirement. TMW® 250 is the ideal selection when designing thermally improved storefront and horizontal ribbon window applications. This versatile system offers glazing from both the exterior or interior. The custom manufactured system is designed primarily for 1" insulated infill, but can easily be adapted for 3/16" to 1-1/16" infills. This labor saving system incorporates screw spline construction for economical fabrication and installation. Complete 2" x 4-3/4" system incorporates a multitude of features including corner posts, expansion mullions, and integral doorframe sections. Freedom in design allows for alternative-glazing caps includes radius or projected rectangular design. Vertical retainer is extruded as an integrals part of vertical mullion, which provides greater structural values. Built-in vertical retainer reduces labor costs and does not require pressure plates, screws and thermal separator. Utilizing snap-on exterior caps allows for different exterior and interior finishes, and creates unlimited design possibilities with associated cost savings. Available in standard and custom anodized finishes and painted applications. Meets all AAMA air, water, and structural requirements.